The revolutionary dream towards building a solid nation for Nigerians has begun with the emergence of APGA's Presidential Candidate Rtd. Gen. John W.T. 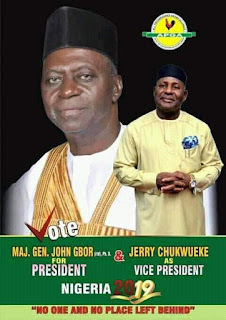 Gbor Ph.D and his vibrant running mate, Chief Jerry Chukwueke. It has become obvious that the world is progressively dynamic but Nigeria's continued dependence on crude oil remains a major concern. It is worrisome that Nigeria's economy is largely, if not completely, dependent on oil proceeds. This has raised questions about the survival of the country in a post oil dispensation. The only answer to this, is fiscal restructuring and diversification of the economy. This has formed the basic and ultimate agenda of the All Progressives Grand Alliance Presidential Team . The team has painstakingly structured a policy which guarantees independent creation of revenue and jobs by each geo-economic region. This will eventually lead to absolute economic independence from the Federal Government. This implies that each zone shall engage in such activities that best portray its competency and create wealth absent federal allocation. The APGA Presidential team equally advocates for massive investment in ranches in the North to put an end to the seemingly endless and now destructive migration of cattle from North to South. This method of cattle rearing has become obsolete and cannot subsist along with mordern developmental trends. It is glaring that such unchecked movement of cattle has led to conflict and bloodshed between herdsmen and farmers. Therefore a well strategized investment in ranching will foster improvement in cattle rearing and lay these clashes to rest. Ultimately, the All Progressives Grand Alliance guarantees that no one and no place shall be left behind in the struggle to reposition and restructure Nigeria. According to Gbor, "Every Nigerian irrespective of culture, tradition, ethnicity and religion will experience the unity, cohesion, peace togetherness and the prosperity that awaits in a new Nigeria led by APGA. "However, all hands must be on deck to put Nigeria back on track. As we galvanise towards egalitarianism, progressive dynamism and fiscal restructuring, it is important that we perform our basic civic duty by getting our PVCs ready to vote APGA in the coming election."